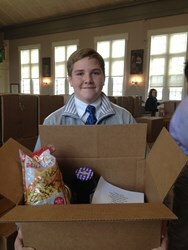 US eighth grader Mike Fedeli helped coordinate the food drive at the Shaker Campus. University School's food drive fills an important need for our families. Providing food to Cleveland families who might not otherwise enjoy a nice meal on Thanksgiving is a long held tradition at Cleveland’s University School. 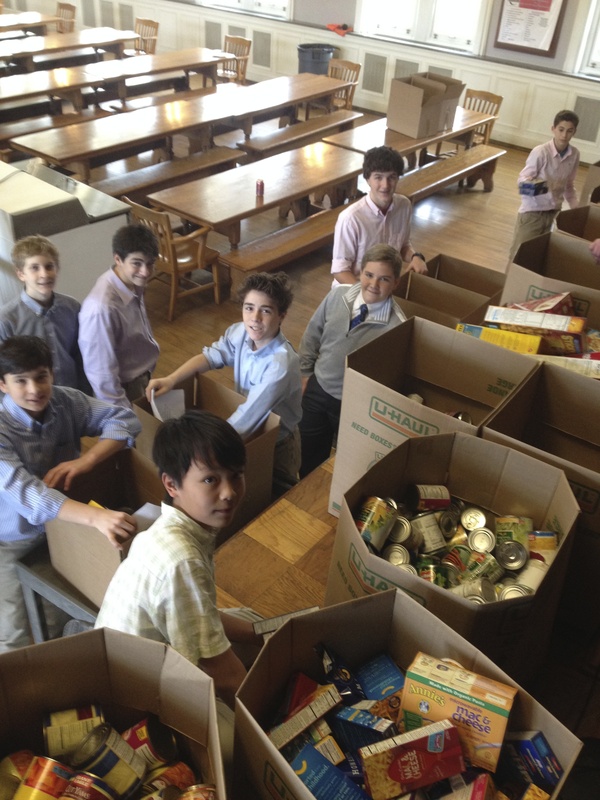 For over three decades, University School has conducted an annual Thanksgiving food drive. This year, students raised over $8000 to buy turkeys and potatoes, and they donated canned goods and other items to feed 270 families over the Thanksgiving weekend. Most of the families live in the Mt. Pleasant neighborhood of Cleveland. At the school’s Hunting Valley Campus, students and faculty members recently packed food boxes that were delivered to Mt. Pleasant NOW for distribution to the families in time for the holiday. “University School’s food drive fills an important need for our low income families to have sufficient food, but it also helps them to experience the joy of family during the holiday season,” said Thomas Stone, Executive Director of Mt. Pleasant NOW. The food drive involves students and teachers from both campuses. At the Hunting Valley Campus (grades 9-12), each of the ten “houses” of students raised funds to feed 21 families, for a total of 210 families. Students and faculty members were asked to contribute $20.00. Boys were encouraged to earn the money by doing extra chores around the house, babysitting siblings or neighbors, or raking leaves. Students also participated in a “sparse” lunch, and the money used for their normal lunches was donated to the food drive instead. At the Shaker Campus (kindergarten- grade 8), the houses collected canned foods and non-perishables to prepare food baskets for 60 families total. University School’s student prefects and house captains help to organize the program. From raising funds and buying the food, to boxing and delivering it to the organization, the drive is largely run by students. Eighth grader Michael Fedeli, a house captain and chairman of the house committee at the Shaker Campus, said it was a big job collecting and sorting the donations from students each morning, but well worth it. “Now these families can have a good, homemade meal on Thanksgiving,” he said. US Upper School students pack food boxes at the Hunting Valley, Ohio, campus.Students at University School's Hunting Valley campus raised $8000 to buy food for Cleveland families. Eighth graders at the US Shaker Campus help with the food drive.At the Shaker Campus, students donated food for 60 Cleveland families. US students Robert Sherman, Chris Thompson, and David Motch help load boxes onto a truck for delivery to Mt. Pleasant NOW.